What is Frontline Plus for Dogs or Cats used for? Frontline Plus for Dogs or Cats is used for the treatment, prevention and control of fleas, ticks and biting lice and also to treat flea allergy dermatitis in Dogs or Cats. Frontline Plus for Dogs or Cats is a fast acting topical treatment that helps get rid of existing flea infestations for at least one month and prevents new flea infestations for up to three months. Frontline Plus for Dogs or Cats also controls brown dog or cat ticks for up to one month, and paralysis ticks for up to two weeks after application, reducing the risk of tick paralysis. Frontline Plus for Dogs or Cats can be used on puppies or kittens from eight weeks old and is safe to use on breeding, pregnant or lactating animals. How does Frontline Plus for Dogs or Cats work? Frontline Plus for Dogs or Cats contains a combination of two insecticides. Fipronil is a broad spectrum insecticide that kills adult fleas, tick and lice within 18 hours of application, by disrupting the insect central nervous system. (S)-methoprene, an insect growth regulator that kills flea eggs and larvae as well as preventing the development of flea pupae, attacking all stages of the flea lifecycle, therefore breaking the flea life cycle while it is on your dog or cat. 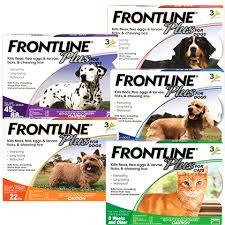 What does Frontline Plus for Dogs or Cats contain? Frontline Plus for Dogs or Cats contains the active ingredients fipronil (100g/L) and (S)-methoprene (120g/L), both insecticides used in combination to treat and prevent infestation of fleas, ticks and biting lice in Dogs or Cats. It also contains ethanol, diethylene glycol monoethyl ether, polyvidone, polysorbate 80. Frontline Plus for Dogs or Cats is a fast acting topical treatment used for prevention and control of flea infestation, and is also used to treat flea allergy dermatitis in Dogs or Cats. Frontline Plus for Dogs or Cats contains a combination of two insecticides, fipronil a broad spectrum insecticide that kills adult fleas within 18 hours of application and gets rid of existing flea infestations for at least one month. (S)-methoprene is an insect growth regulator that kills flea eggs and larvae as well as preventing the development of flea pupae, attacking all stages of the flea lifecycle, therefore breaking the flea life cycle while it is on your dog or cat. Frontline Plus for Dogs or Cats prevents new flea infestations for up to three months. How should Frontline Plus for Dogs or Cats be applied? Each pipette in the pack of Frontline Plus for Dogs or Cats is a single treatment in one application. To apply Frontline Plus to your dog’s or dog or cat’s skin, part the coat so the skin is visible at the point between the shoulders and squeeze the pipette to apply the entire contents to the skin, where it will spread throughout your Dogs or Cats coat within 24 hours and remains effective even if your dog or cat gets wet or is shampooed. To allow Frontline Plus to work, leave for 48 hours after application before allowing your dog or cat into water. How often should you apply Frontline Plus for Dogs or Cats? If you have more than one dog or cat in your household you should treat them all at the same time.